Cheesecake or brownie? Why are some decisions in life so tough! As a food blogger I can safely say you can have your cake and eat it too; or in this case, your cheesecake and brownie all at the same time. Life is all about finding the right balance; usually you have to decide on one thing, while sacrificing something else. Well, not with this wonderful 2 in 1 recipe! These Swirled Vanilla Cheesecake and Chocolate Brownie Bars are oh so satisfying and save you the hassle of deciding. It’s a little more work since you are in essence making two recipes, but don’t let that stop you. Trust me when I say it will all be worth it. Start off by making a rich homemade chocolate brownie batter. I suggest skipping the store-bought box and giving yourself that sense of accomplishment, plus you have more control of what ingredients (ideally natural) that you are putting into your dessert. Then make the vanilla cheesecake batter. Here comes the fun part. Pour some of the chocolate brownie batter into a baking dish, top with cheesecake layer, and spoon separate pools of the brownie batter on top. Then use a knife to swirl the vanilla cheesecake into the chocolate brownie mixture to create a marbled effect. This is the creative part, make whatever pattern you want; swirls, circles, or lines. 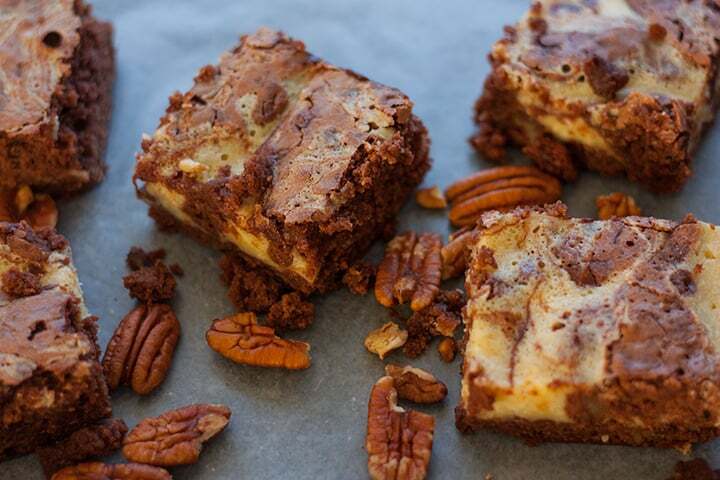 As if this recipe wasn’t flavorful enough, mixed in toasted pecans add crunch to the chewy brownie bars. It’s just the right mixture of flavor and texture. This is all easier than it sounds, follow the recipe below and you’ll soon be enjoying these Swirled Vanilla Cheesecake and Chocolate Brownie Bars. Check out my fancy animated photograph that shows the steps as well. Cook pecans in a pan over medium-high heat for 3-5 minutes, stirring often. When toasting nuts be careful to watch closely and not over-cook. Toast them until just golden and remove from heat. The natural oils in nuts conduct heat and continue to cook even after removing from pan. By the time they are dark brown it’s usually too late, and you get that burnt taste instead of toasted taste. I shot this in natural light at 1/400 sec, f/ 3.0, ISO 400 . The texture, patterns and colors are the star of this recipe, creating a visually appealing image. It helps to cut them into bars, creating even more shapes; instead of photographing the entire pan. Place over parchment paper to create a neutral background and draw the viewer’s eye towards the brownie bars. Pecans added to the scene compliments the colors and create a more energetic image. It also shows this ingredient that would otherwise be unrecognizable. 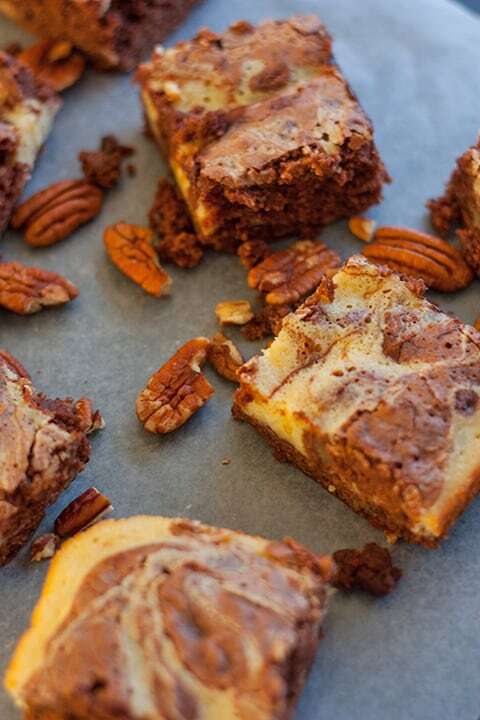 Swirled Vanilla Cheesecake and Chocolate Brownie Bars with toasted pecans are oh so satisfying and save you the hassle of deciding which dessert to make. Preheat oven to 350º F. In a medium saucepan cook chocolate chips and butter over low heat, stirring often, until melted. Remove from heat and allow to cool slightly. Brownie mixture: In a large mixing bowl or with hand mixer, beat 2 of the eggs on medium speed until foamy, 3-5 minutes. Add 1 ¼ cups sugar, water, and 1 teaspoon vanilla. Beat on medium speed, about 5 minutes until slightly thickened and light-yellow color. Beat in melted chocolate mixture until combined. Hand stir in 1 cup of flour, salt and baking powder, then stir in toasted pecans. Set aside. Cheesecake mixture: In a separate medium bowl, beat the remaining 2 eggs, 1 teaspoon vanilla, 2/3 cups sugar, 2 tablespoons flour, cream cheese, and lemon juice until smooth. Prepare a 13x9x2-inch baking pan by lining bottom and up the sides with foil, grease foil. Pour half of the brownie mixture into the pan and spread evenly. Carefully spread all of the cheesecake mixture evenly over the brownie mixture. Spoon small amounts of the remaining brownie batter over the cheesecake layer (see photos above in post). Then using a butter knife, gentle swirl just until marble pattern forms. Bake for 45 minutes at 350º, or until knife or toothpick inserted comes out clean. Cool slightly, then remove brownies by lifting edges of foil. Cut into squares. Leave a comment below or contact me directly, and I will personally respond to help you. 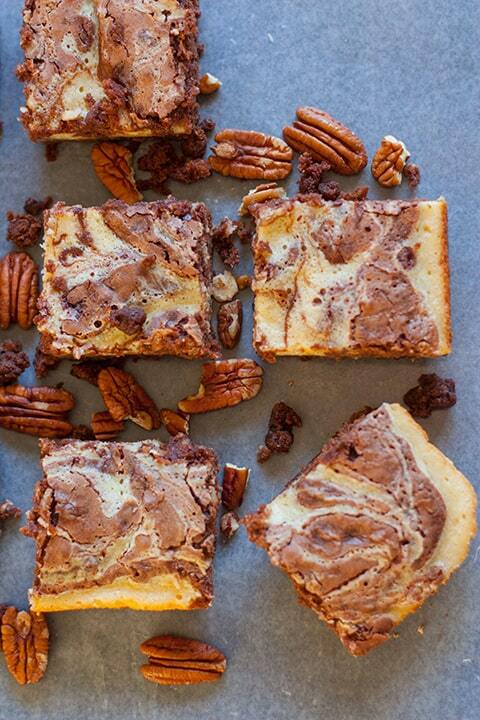 Love cheesecake swirl brownies! You get the best of both worlds! They look absolutely divine! Thanks Jess! Your recipes look great and gonna check your blog out more. Honeycomb donuts, yum! I love swirled brownies! These look awesome! Thanks Anna! Your blog looks tasty and looking forward to checking it out. Thanks Carmen. This is a pretty incredible mix of baked goodness.